KeyBank Rochester Fringe Festival: The University of Rochester Institute for Popular Music and the Eastman School of Music present two concerts on Sept. 14, 2018--each concert features a classic 1970s album played in its entirety. 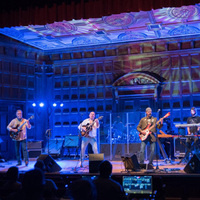 At 7 pm, Going for the One will perform The Yes Album and at 9 pm the IPM's League of Extraordinary Uncles will perform Led Zeppelin IV, featuring UR and Eastman faculty, staff, and students. Both concerts are in Kilbourn Hall at the Eastman School of Music and each will require a separate ticket. This special evening is part of the Rochester Fringe Festival and tickets may be purchased from the Fringe Festival site.